Last month we did an in depth article on the AD SERIES 221. With Singer bringing out a brand new electric portable sewing machine right at the beginning of a depression was a pretty bold move on their part. Records show an elapse of 11 month's between the first and second production runs, October 1933 to September 1934. Something tells me a few Singer Executives may have had some bad vibes about their new portable during this time. Sales seem to have boomed though from September 1934 to September 1935. MONDAY-SEPTEMBER-23-1935 On this day AD999999 rolled off the assembly line, bringing an end to the AD SERIES.A Singer reported TOTAL of 53,044 AD's being built. ALSO on this date September-23-1935. Singer rolls off a new series of the 221. The AE SERIES. Since the AE was built right behind the AD, the serial numbers start at AE000001 to AE007000. This also made the serial number, the machines production number, on this first production. In this QOW, Leo and I will walk you around a 100% Original AE000013 Machine. I did change out the wiring. This machine had Cotton wiring, just like the AD series. On the Metal Foot Controls only. The AE SERIES were built from 1935 to 1938; there were 9 Production Runs of the series. For a total of 132,000, Almost 3 times as many as the AD SERIES. IN the photo below you will notice from the side the EARLY AE was identical to the old AD SERIES Chrome Balance Wheel, Solid Unmarked Bobbin Wheel, Split Base Frame and Decal to Light Switch. In this photo, the machine looks identical to a Late Model AD series. The Side Mounted Bobbin Winder Guide was Black, ON ALL AE Split Base Machines (CHROME was on the AD ONLY!!). While Singer was recasting the frame, they also Closed up the hole and did away with the Black Side Mounted Bobbin Winder Guide. 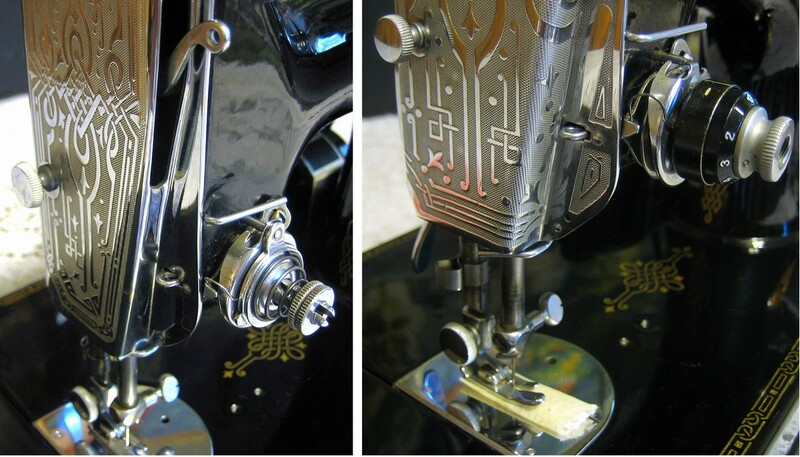 IN the photo below, the AE had the Un-Number Thread Tension. I have Thousands of AE serial numbers, and Records show the UN-Numbered Thread Tension was around as late as December-8-1937, AE77XXXX era. The AE had THREE foot controls, The Metal ones were issued in the September and December 1935, production runs. The rare 6 hole foot control can be found from September 1935 (very few), then again from December 1935 through about late July 1936. In the later part of July 1936 era the Solid foot control begins to show up. The 6 hole foot control was also the First Singer foot controls to go from Cloth wiring to plastic or rubber wrapped wiring. Singer also dropped the Glass SINGER USA marked wall plugs for the rubber BELDEN wall plugs. Singer would use the Belden plugs for the life of the American 221. The AE Series had THREE Manuals. The MARCH 1935 Manual was a left over from the AD SERIES machines, and was used for the First production run of 1935. The last Manual printed for the AE series was (737). This is one of the Worst 221 Manuals Singer ever printed. It shows up with JUNE-1937 machines. MY GUESS! Singer ran out of Manuals and said I needed them yesterday. The (737) Manual shows a 1936 SPLIT BASE machine with a 1937 Numbered Thread Tension. That my Friends NEVER HAPPENED. By AE216XXX, July 1936 the Split Bases were Gone. And MANY of the FULL BASE AE77XXXX December 1937 DIDN'T have Numbered Tensions. BY MAY-24-1938 the AE SERIES had gone through a complete change. In fact there were more changes made on the AE series than in any of the other 221 series. THREE different Foot Controls; 193852 - METAL, 194372 - 6 Hole Bakelite and 194584 - Solid Bakelite. TWO Bobbin Wheels; Solid and Stamped. TWO Bobbin Winder Guides; Front Mounted and Top Mounted. TWO Front bed DECALS: Old, all the way to light Switch and New, shortened to Bobbin winder Guide. TWO Thread Tensions; Un-numbered and Numbered. TWO Motors; Unmarked and 700. TWO Frames; SPLIT BASE and SOLID BASE. TWO Face Plates; TYPE 2 Stagger Leg and Even Leg or Scroll. And finally from TWO Serial Number Bases to Just ONE. WE didn’t mention that SINGER made a “TEXAS CENTENNIAL EXPOSITION” 221 for the 1836~1936 Texas Centennial. Leo and I Know of TWO 221’s from this era: AE061724 and AE214411. I have HEARD a RUMOR that Leo may have a QOW coming later this summer with a 1936 TEXAS CENTENNIAL 221.